The medieval hilltop village of Roccatederighi, rises on a buttress of Mount Sassoforte, from which one can admire a broad panorama. The villages of Roccatederighi and Montemassi house shops and restaurants, and are both very beautiful in their own right. The castle of Montemassi is without doubt the most important monument of the municipality of Roccastrada if not of the entire Maremma, due to its importance as a historical document (it is depicted in the famous fresco ‘Guidoriccio da Fogliano at the siege of Montemassi‘ in the Palazzo Pubblico in Siena attributed to Simone Martini) and as a high example of Gothic architecture. The castle, which crowns the village on a hill 280 meters above sea level, is constituted on the northern side by the ruins of the palace. On the southern side are the remains of a quadrangular tower, with embrasures, with remains of brick vaults and fine ornaments. cool. Remember to bring water with you as it is not possible to get water along the trails. 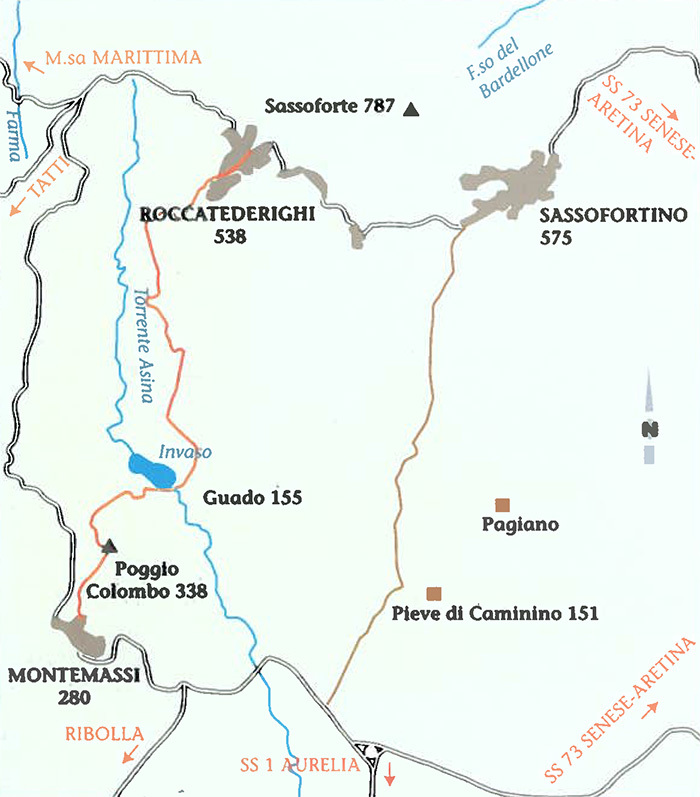 The first part of this itinerary goes through chestnut trees woods and crops going round the Rhyolitic spur on which Roccatederighi was built. In this part of the paths there is a botanical curiosity: the prickly broom (Ulex europaeus), which is not to be found anywhere else in our Municipality. Crops and olive trees becomes now predominant: they divide the land into small proprieties, giving the territory its characteristic aspect. We carry on towards the valley: behind us Roccatederighi’s church and the bell tower are easily spotted among the Rhyolitic rock spurs. We then get to the dyke of the torrent Asina and we take the gravel road leading to Montemassi. There are no more crops but woods of turkey oak, arbutus, heather and cystisus. Further up we can enjoy a wonderful view from two panoramic spots: the upper part of the road we are on from which we can see the village of Roccatederighi with the side of the mound sketched with edges, rows of olive trees surrounded by woods. The other spot is Poggio Colombo from which we can get a 360° view. Montemassi is recalled for the first time in history in 1076. During the 13th century the castle was part of the possessions of the powerful family of Aldobrandeschi and, among the many fortresses that they possessed in the Maremma, was one of their strongest. In 1260 the fortress was almost completely demolished during a siege. In 1306 the castle was subjected to the Pannocchieschi. In 1328 with the support of Castruccio Castracani of Antelminelli happened the rebellion of the castle against the dominance of Siena, but the strongest Sienese militias were able to conquer back the stronghold and to restore the possession (this is the event celebrated in the aforementioned “Guidoriccio” fresco in the Palazzo Pubblico in Siena). The Siena republic donated the castle to the Salimbeni family that lost it in 1375 following a rebellion. Passed again to the Republic of Siena, in 1404 the decision to dismantle the fortress was taken in order to prevent any rebel to set in the castle and initiate from there a war. Ferdinand II of Tuscany in 1632 assigned Montemassi as a feud to Giovanni Cristofani Mulazzo of Malaspina. On 7 April 1770 the Malaspina sold it to the Marquis Domenico Cambiaso di Genova. After this the castle was left untenanted and slowly went in ruins. From Podere Santa Pia, you can enjoy a spectacular view over the plains of the Maremma. 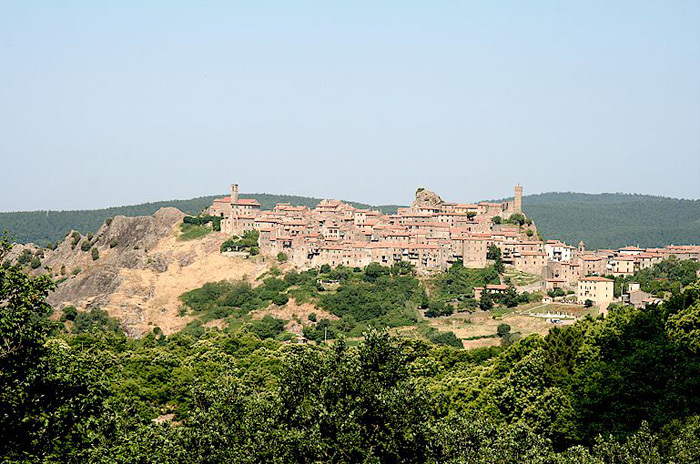 The area where Podere Santa Pia is located is called Alta Maremma, since the villages and castles of the area were built on the tops of hills from which it was easier to protect the inhabitants during the dark centuries of the Middle Ages. On a clear day it is possible to see the sea: the view is breathtaking. The area is particularly suited for people who love nature and the outdoors, as there are a number of trails ideal for hiking and biking. Siena is easily reachable too, and so are the Val d'Orcia, Saturnia Hot Springs and the beautiful villages and castles of the area, such as Montalcino and Poggio alle Mura and Castello Banfi, the major producer of Brunello di Montalcino D.O.C.G. wine). The old roads leading to Siena pass through woods, medieval villages and old abbeys such as San Galgano Abbey, where you can admire the famous sword in the stone.